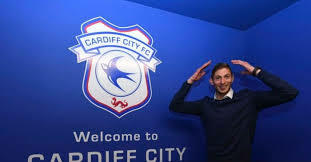 January 23 – Hopes are tragically fading fast for Argentine-born star Emiliano Sala 36 hours after the light aircraft in which he was the sole passenger disappeared in the English Channel en route to Cardiff where he had signed for the Premier League club. Sala was flying from the French city of Nantes to his new club when the plane lost radar contact off Guernsey late on Monday. Rescue aircraft and boats had already searched more than 1,000 square miles of sea for the single-engine plane. The 28-year-old forward joined struggling Cardiff from FC Nantes last week for a club record fee of about €17 million after scoring 12 goals for the French club this season. In a voice message left by Sala, published by Argentine newspaper Clarin, he said that it seemed as though the plane was “about to crash” and reportedly sent a WhatsApp voice message to family saying he was “really scared”. The plane had been cruising at 5,000 feet (1,525m) when the pilot requested to descend to a lower altitude on passing Guernsey. It lost radar contact at 2,300 feet. Cardiff City chairman Mehmet Dalman said players and fans were in a “state of shock” adding that the club had received messages of support from around the world. He also confirmed that the club had not booked the plane for the trip, adding that Sala had “made his own arrangements”. After joining Nantes in 2015, Sala had scored 48 goals for the Ligue 1 side. Overnight, fans in the northern French city laid flowers at a fountain as a tribute to Sala and the plane’s pilot with floral tributes also left at Cardiff City. French sports newspaper L’Equipe carried the news of Sala’s plight on its front page on Wednesday with the headline: ‘The disappearance of a warrior’. “In Nantes, the wait has been unbearable for the supporters of a forward loved for his battling qualities,” the paper added.